All three major U.S. equity markets were positive for March. The Nasdaq Composite led with a return of 2.70 percent. The S&P 500 and the Dow Jones Industrial Average (DJIA) had gains of 1.94 percent and 0.17 percent, respectively. For the quarter, the Nasdaq, S&P 500, and DJIA gained 16.81 percent, 13.65 percent, and 11.81 percent, respectively. Market fundamentals worsened. The first-quarter earnings growth estimate for the S&P 500 fell from 2.9 percent to a loss of 3.9 percent. Analysts do expect positive earnings growth for the next three quarters, however. From a technical perspective, all three major U.S. indices spent much of January and parts of February below their 200-day moving averages. But they ended the quarter above this important technical level. For international markets, the MSCI EAFE Index gained 0.63 percent for March and 9.98 percent for the quarter. The MSCI Emerging Markets Index gained 0.86 percent for March and 9.97 percent for the quarter. Both indices finished the period above their trend lines. In fixed income, the Bloomberg Barclays U.S. Aggregate Bond Index gained 1.92 percent for the month and 2.94 percent for the quarter as yields declined and prices rose. The 10-year U.S. Treasury yield started the quarter at 2.66 percent and finished at 2.41 percent. High-yield bonds, as measured by the Bloomberg Barclays U.S. Corporate High Yield Index, gained 0.94 percent in March and 7.26 percent for the quarter. Only 20,000 new jobs were added in February, a sign that job growth could be slowing. 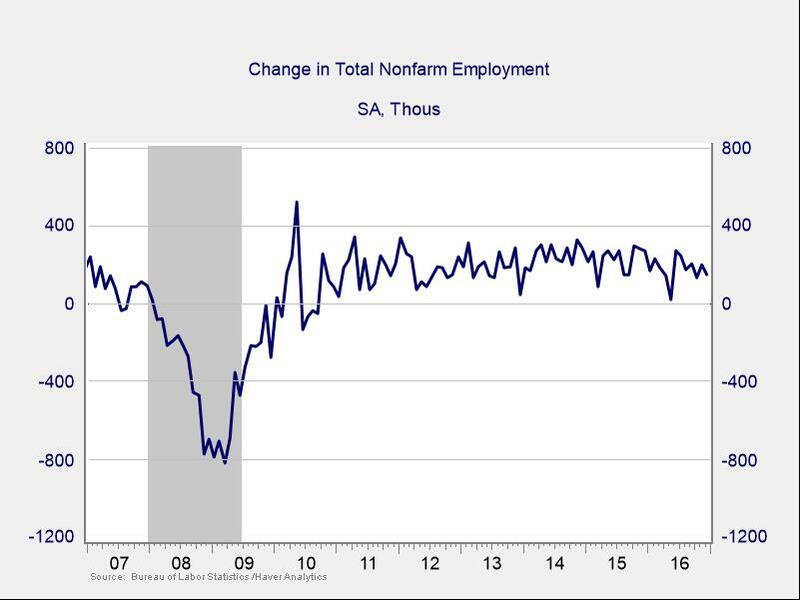 Employment growth accelerated at year-end before falling in 2019 (see Figure 1). Consumer confidence reversed its recent bounce to trend lower. A strong jobs market is a major driver of consumer confidence. Weakness here may be a worrying signal. Consumer spending growth also pulled back. January’s personal spending report showed growth of 0.1 percent, and retail sales in February fell 0.2 percent. The Institute for Supply Management Manufacturing and Nonmanufacturing indices, which measure producer sentiment, rebounded following declines in December and January. Business investment grew, with durable goods orders increasing 0.3 percent in January. Business confidence appears to have rebounded from the year-end turbulence. Business spending continued to grow. In response to weak data, the Federal Reserve (Fed) indicated there would be no further rate hikes and that it will end its balance sheet runoff. First quarters have been weak over the past several years, only to rebound. So, the next couple of months are important. We avoided another government shutdown. Further, lower mortgage rates made buying a house more affordable, leading to increases in new and existing home sales in February. Abroad, the Brexit negotiations appear deadlocked, although the deadline for a no-deal Brexit has been extended. A slowdown in Chinese growth could also affect markets. A new risk is the yield curve inversion. After the Fed announced a looser monetary policy, yields on long-term government debt went down. This move left longer-term interest rates lower than shorter-term ones. As a result, the yield curve inverted, which typically signals a higher risk of recession. But this risk is likely for 2020—not 2019. U.S. markets showed resilience in the first quarter. Economic growth has slowed but continues. There’s room for confidence to move higher. Finally, earnings growth disappointed, but analysts’ estimates for the rest of 2019 are positive. Conditions may improve as confidence and spending catch up to 2018 levels. Further, lowered interest rates are generally supportive of faster growth. The takeaway is that volatility can happen quickly. The past six months highlight the importance of creating well-diversified portfolios that can withstand short-term volatility. June was a volatile month, with earlier gains offset by later losses. Still, both the S&P 500 Index and the Nasdaq Composite ended the month in positive territory. The S&P 500 rose 0.62 percent during the month, while the Nasdaq led the way with a gain of 0.98 percent. The Dow Jones Industrial Average was the lone exception, as it declined 0.49 percent. All three U.S. indices were positive for the quarter. The S&P 500 was up 3.43 percent for the period, and the Dow gained 1.26 percent. But the Nasdaq did best, rising 6.61 percent. Despite the volatility at month-end, the fundamentals for U.S. markets remained positive. According to FactSet, the estimated earnings growth rate for the S&P 500 in the second quarter stands at 20 percent (as of June 29). This would represent the second-highest quarterly earnings growth since 2011. We know that fundamentals drive long-term performance. If companies meet expectations, then this strong second-quarter growth should encourage further performance. While fundamentals were supportive for the month, technicals were mixed. The S&P 500 and the Nasdaq remained above their long-term trend lines. The Dow, on the other hand, dropped below its trend line for the first time since June 2016. This is worth watching, but a drop like this is not that unusual. In fact, the S&P 500 closed below its 200-day moving average in April before quickly recovering. Now let’s turn to foreign stocks, which did worse in June than the U.S. markets. The MSCI EAFE Index, which represents developed markets, declined by 1.22 percent during the month. This drop took it from roughly even to a decline of 1.07 percent for the quarter. Emerging markets did even worse. The MSCI Emerging Markets Index declined by 4.09 percent for the month and by 7.73 percent for the quarter, on a rising dollar and growing policy concerns. Technical factors for international equities also weakened during June. The MSCI EAFE Index spent the second half of the month below its 200-day moving average. This drop came after the European Central Bank announced that it plans to end its stimulus programs and to hike rates within the next year. Emerging markets did even worse from a technical perspective; they spent almost the entire month beneath the trend line. Fixed income also had a challenging month and quarter, as rising rates negatively affected prices. As expected, the Federal Reserve (Fed) voted to hike the federal funds rate by 25 basis points at its June meeting. Further, the statement released by the Fed was more optimistic about the economy than expected, suggesting that more rate hikes are likely. The Bloomberg Barclays U.S. Aggregate Bond Index declined by 0.12 percent during the month and by 0.16 percent for the quarter. The 10-year U.S. Treasury yield started the quarter at 2.73 percent. It reached a high of 3.11 percent before ending the quarter at 2.85 percent. High-yield bonds, which are typically less tied to moves in Treasury rates, had a better month and quarter than did investment-grade fixed income. The Bloomberg Barclays U.S. Corporate High Yield Index gained 0.40 percent during the month and 1.03 percent during the quarter. Spreads remained in the 3-percent to 4-percent range during the quarter, as investors continued to find high-yield bonds attractive. Most of June’s major data releases painted a picture of stronger growth in the second quarter. Consumers and businesses saw high levels of confidence and spending growth throughout the month. 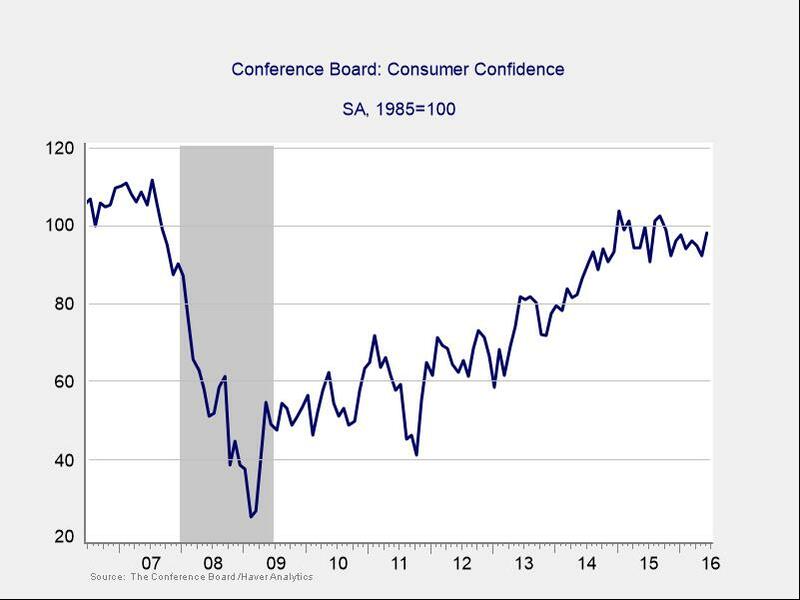 Although consumer confidence did decline slightly in June, both major measures of confidence remain near multidecade highs. Historically, the health of the jobs market has been one of the main factors that influences confidence. So, it is no surprise that confidence remains high after May’s strong employment report. The economy added 223,000 new jobs in May, beating expectations. 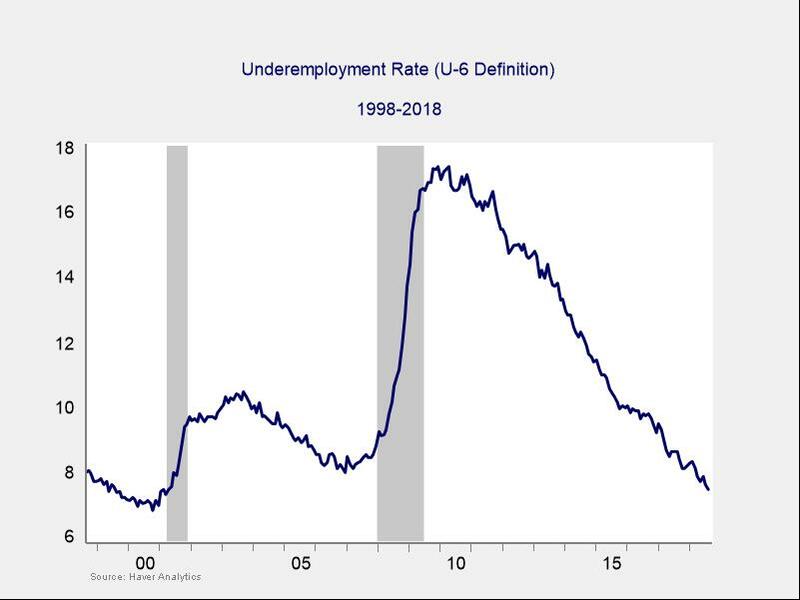 The unemployment rate fell to an 18-year low of 3.8 percent, and the underemployment rate declined. Wage growth came in better than expected. It increased to 2.7 percent on an annual basis, close to the highest level since the crisis. 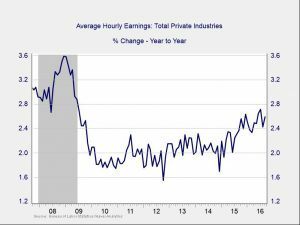 Strong employment growth has been a major driver of the ongoing economic expansion, but wage growth has lagged. As such, this uptick in annual wages is very encouraging. Wage growth is important, but just as important is consumer willingness to spend. Here again, the news was positive. The combination of income growth and high confidence led to faster spending growth. Overall spending grew by 0.6 percent, well above expectations of 0.4 percent. The retail sales data was even better, with 0.8-percent headline growth in May. 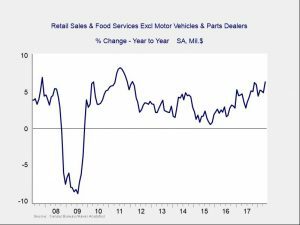 The core figure, which strips out volatile vehicle purchases, rose by 0.5 percent on a month-over-month basis. This rise brought year-over-year core retail sales growth to its highest level since early 2012, as you can see in Figure 1. While consumer spending growth was positive across the board, business spending was mixed. May data was weak, with durable goods orders dropping by 0.7 percent. This drop was due in large part to a dramatic 7-percent decline in the volatile transportation sector. The core figure, which excludes transportation, fell by a more modest 0.3 percent in May. Despite the weak month, a positive revision from 0.9-percent to 1.9-percent growth in April left the quarterly figure looking healthy. The overall trend for business investment remains positive. Although the economy is generally healthy, there are signs of slowing growth. After a multiyear period of solid growth—driven by low mortgage rates and relatively affordable prices—housing appears to have slowed. On the supply side, home builder confidence dropped in June. Here, rising lumber costs and a lack of labor hurt the profitability of new home construction. Building permits, which are the first step for new home construction, echoed the decline in home builder confidence. They fell by 4.6 percent during the month. On the demand side, home buyers appear to be taking rising home costs in stride, as new home sales rose by more than expected in May. Existing home sales dropped slightly, suggesting that declining affordability may be starting to make a difference. Housing growth has historically had a multiplier effect on overall economic growth as new home buyers spend more on furnishings and repairs. So, any slowdown in housing is something that should be monitored closely. While the economy is growing at a healthy pace, politics and policy present the biggest risks to the financial markets. Again, the news here is a bit of a mixed bag. On a positive note, last month’s major concerns surrounding a euroskeptic government in Italy and the summit between President Trump and North Korea’s Kim Jong-un have largely subsided. But these very real improvements have been overshadowed by growing concerns about trade conflict. These worries have been fueled by the U.S. imposition of tariffs, along with the subsequent retaliatory actions from most major global economies. It is still too early to know exactly how the trade conflict will play out. The probability remains that a negotiated deal will be reached before matters become much more serious. Nonetheless, effects are already showing up in the economy. If the situation does worsen, it will almost certainly lead to lower levels of growth both domestically and abroad. While rising political risks are a valid concern, the U.S. economy continues to grow at a solid pace. The positive tailwinds from tax reform and the strong jobs market are driving consumer and business spending, which in turn should lead to faster economic growth for the rest of the year. There are certainly risks to this outlook—namely a slowdown in housing and rising political risks. On the whole, however, things appear to be pretty good right now. Of course, risks can always materialize and affect markets. As such, a well-diversified portfolio that matches goals and time horizons is still the best way to prepare for the future and weather the potential storm. Market drops are scary, especially when they come day after day. The decline on Monday, February 5, was particularly bad. In fact, it has been billed as the largest point drop ever for the Dow Jones Industrial Average. Looking at that, it’s normal to think that the stock market is in a downward spiral. History shows, however, that this is often not the case. Although declines like we have seen in the past week are not fun, they generally are not reason to panic. Let’s look at this more closely. February 5 was a bad day; the last time we had a day like that was in 2011, about seven years ago. This tells us two things about how we should react. First, this was an unusual event, so we should be paying attention. Before we get to the second, though, answer this: Do you remember when the market had that bad day in 2011? Has it affected your life since then? The answer for almost everyone is no, which tells us the second thing—that bad market days don’t really matter over time. What matters is how markets perform over the long term. If you ignored that bad day, and forgot about it, you probably ended up doing quite well. Here’s something else to consider. This market drop has taken us back to the levels of late November 2017. So, the drop, in fact, doesn’t look all that bad. We are still near all-time highs. And we are still above the long-term trend lines that support further market gains. In other words, from a market perspective, we are still in good shape. This is possible because the economic fundamentals remain very strong. Consumer and business confidence are high, hiring and investment continue, and economic growth appears more likely to accelerate than to slow. Corporate earnings are growing rapidly, and expectations are getting better, not worse. The factors that have driven the market to all-time highs are still there, ready to support it despite the recent declines. So, what is driving the market down? In short, a break in confidence. Perhaps investors started to worry when interest rates moved up at the end of January. Or maybe they are growing more concerned about the pending debt ceiling debate. Whatever the reason, they became less confident—and decided to sell. The question now is whether that loss of confidence will hold or not. The strong economic fundamentals suggest that confidence will come back—and with it, so will stock valuations. We saw the same situation in early 2016, the last time the market declined significantly, when confidence faded and then returned—and with it, so did the stock market. We have seen this movie before, and it had a happy ending. Happy endings aside, we could certainly see a further decline from here. These confidence-led declines tend to be sharp, so more downward moves are possible and even likely. They also tend to be short, however, burning themselves out relatively quickly. The biggest risk for most investors is panicking over short-term volatility. If you had sold on that bad day in 2011—the one you don’t remember today—you would have missed out on years of gains. Short-term pain is, unfortunately, the price we pay for long-term gains. None of which is to minimize how real that short-term pain is, of course. We all feel it. The right solution, though, is to understand where that pain comes from—and do our best to ignore it. That way, we can remain focused on maintaining a well-diversified portfolio aligned with our long-term financial goals. Certain sections of this commentary contain forward-looking statements based on our reasonable expectations, estimates, projections, and assumptions. Forward-looking statements are not guarantees of future performance and involve certain risks and uncertainties, which are difficult to predict. The Dow Jones Industrial Average is a price-weighted average of 30 actively traded blue-chip stocks. All indices are unmanaged and are not available for direct investment by the public. Past performance is not indicative of future results. Here is a recent post from Commonwealth’s Chief Investment Officer, Brad McMillan. The Trump Era: What Happens Now? Equity markets around the world had a tricky October. The Dow Jones Industrial Average posted a loss of 0.79 percent for the month while the Nasdaq and S&P 500 indices were down 2.27 percent and 1.82 percent, respectively. All three spent most of the month in the red, as concerns about weak economic news and the upcoming presidential election weighed on returns. Despite the trick in returns, a treat came in the form of better corporate earnings, where both expectations and results for the third quarter of 2016 have improved substantially. As of the end of October, with 58 percent of S&P 500 companies having reported earnings, the blended third-quarter earnings growth rate was 1.6 percent, up from the 1.7-percent decline expected at the start of the period. If we do see earnings growth for the quarter, it will be the first year-over-year growth in earnings since the first quarter of 2015. Because the growth reported thus far has been widespread─with all 11 S&P 500 sectors reporting higher growth rates than expected─it seems quite possible that we will end up with earnings growth. This would help support U.S. equity markets going forward. October’s market declines notwithstanding, technical trends remained positive for the major U.S. indices. All three were comfortably above their respective 200-day moving averages, signaling healthy technical support. Developed international markets also had a tricky October. The MSCI EAFE Index was down 2.05 percent on concerns about the rocky path leading to a recently ratified trade deal between Canada and the European Union. But, again, technical trends stayed positive, as the index spent the entire month above its 200-day moving average, suggesting that the longer-term outlook continues to be positive. Emerging markets, as represented by the MSCI Emerging Markets Index, ended October up 0.25 percent. Technicals were strong, as the index was above its 200-day moving average for the month. The U.S. fixed income sector had a difficult October, with the Barclays Capital Aggregate Bond Index posting a 0.76-percent loss. Much of the weakness can be attributed to an increase in interest rates, as the 10-year Treasury yield rose from 1.60 percent at the end of September to 1.84 percent at the end of October, matching highs last seen in May. The increase was due to rising expectations of an interest rate hike by the Federal Reserve (Fed) at its December FOMC meeting. U.S. corporate high-yield bonds─less correlated to interest rate changes than fixed income offerings─performed better in October. The Barclays Capital U.S. Corporate High Yield Index finished the month with a gain of 0.39 percent. Performance was again driven by spreads on high-yield bonds, which tightened to their lowest levels in more than a year as confidence in corporate credit remained high. The economic data released in October held more treats than tricks, as the economy continued to reverse the slowdown of earlier months. Employment growth was strong, with a healthy 167,000 jobs added in September, and both hours worked and wages increased. Average hourly earnings growth continued an uptrend, as illustrated in Figure 1, moving toward a post-recession high. Despite the positive employment and income news, consumer confidence dropped somewhat, although it remained at reasonably healthy levels. Interestingly, the decline was due in large part to a downturn in how consumers felt about present conditions, which may have been associated with the election campaign, as longer-term expectations continued steady. This metric will be worth watching next month. 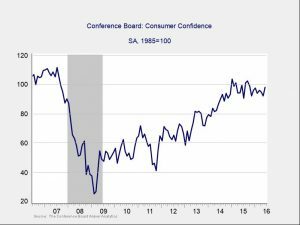 Although consumer confidence moderated, business confidence increased. Both the ISM Manufacturing and Non-Manufacturing indices rebounded in October, with the manufacturing index returning to expansionary territory and the non-manufacturing index hitting an annual high. These results indicate that the previous declines may have been temporary blips rather than signals of a sustained slowdown. Even though much of the economic data reported in October was good, there were a few tricks. Durable goods orders declined slightly, indicating that businesses may be postponing large purchases, possibly due to the uncertainty around the U.S. presidential election. Housing also retreated a bit, with a slowdown in starts and new home sales; however, confidence remained strong, as existing home sales increased. Here, again, the end of election season could provide more clarity and lead to faster investment and construction growth. The first estimate of third-quarter GDP growth was a treat, at 2.9 percent, well above expectations and more than double the growth seen in the second quarter. This solid number shows that the economic recovery is continuing despite the slowdown earlier in the year. The report’s details, however, did include some tricks, as a large portion of GDP growth was driven by increases in exports and inventories. The export growth shows that the headwinds caused by the strong U.S. dollar may be passing, and the inventory uptick may help offset the five straight quarters of declines that had dragged growth down. That’s good news. But the trick may be that these are exceptional events and not guaranteed to continue. Nevertheless, at minimum, these trends should no longer slow growth. With international risks still restrained during October, the U.S. election took center stage. Although many polls and betting markets favor a Clinton presidency, changes to that expectation have the potential to increase political and economic uncertainty, perhaps creating volatility in the financial markets. For example, the recent announcement that the FBI is investigating e-mails related to a high-level Clinton staffer caused a major swing in global equity and foreign exchange markets toward month-end, and we may see more swings like that. Apart from the election, the Fed has created uncertainty around whether it will raise interest rates in December. Although the market expects it to do so, the FOMC has cautioned that any rate hike would depend on economic conditions; a failure to hike rates when expected could rattle markets. Heading into year-end, with investors uncertain about the election and the Fed, market volatility is possible. That said, positive economic news combined with the return of earnings growth should help bolster markets. As always, even though short-term swings can be worrying, a well-diversified portfolio matched with a long-term perspective continues to offer the best path to reaching financial goals, despite any setbacks along the way. Disclosure: Certain sections of this commentary contain forward-looking statements that are based on our reasonable expectations, estimates, projections, and assumptions. Forward-looking statements are not guarantees of future performance and involve certain risks and uncertainties, which are difficult to predict. Past performance is not indicative of future results. Diversification does not assure a profit or protect against loss in declining markets. All indices are unmanaged and investors cannot invest directly into an index. The Dow Jones Industrial Average is a price-weighted average of 30 actively traded blue-chip stocks. The Nasdaq Composite Index measures the performance of all issues listed in the Nasdaq Stock Market, except for rights, warrants, units, and convertible debentures. The S&P 500 Index is a broad-based measurement of changes in stock market conditions based on the average performance of 500 widely held common stocks. The MSCI EAFE Index is a float-adjusted market capitalization index designed to measure developed market equity performance, excluding the U.S. and Canada. The MSCI Emerging Markets Index is a market capitalization-weighted index composed of companies representative of the market structure of 26 emerging market countries in Europe, Latin America, and the Pacific Basin. It excludes closed markets and those shares in otherwise free markets that are not purchasable by foreigners. The Barclays Capital Aggregate Bond Index is an unmanaged market value-weighted index representing securities that are SEC-registered, taxable, and dollar-denominated. It covers the U.S. investment-grade fixed-rate bond market, with index components for a combination of the Barclays Capital government and corporate securities, mortgage-backed pass-through securities, and asset-backed securities. The Barclays Capital U.S. Corporate High Yield Index covers the USD-denominated, non-investment-grade, fixed-rate, taxable corporate bond market. Securities are classified as high-yield if the middle rating of Moody’s, Fitch, and S&P is Ba1/BB+/BB+ or below. With the end of 2016 rapidly approaching, you may be setting goals and resolutions for the New Year. Starting fresh is always a great feeling, but the scale of what we set out to accomplish sometimes becomes overwhelming as the year progresses. The question is, how can you stay motivated to meet your financial goals in the coming year? Check your credit report. Request your free credit report at annualcreditreport.com and review it carefully for mistakes or suspicious charges, which could be a sign of identity theft. Although this may seem like a lot of information to take in at once, glancing at the checklist each month and being ready for important retirement-related dates can greatly improve your sense of financial security, granting you confidence in 2017—and beyond. Despite a dramatic pullback on the unexpected vote by Britain to exit the European Union, U.S. markets rallied at month-end. The S&P 500 Index ended June up 0.26 percent. The Dow Jones Industrial Average performed slightly better, gaining 0.95 percent, while the Nasdaq underperformed, losing 2.06 percent for the month. For the quarter, results were similar. The S&P 500 led the way with a gain of 2.46 percent, the Dow was up 2.07 percent, and the Nasdaq lost 0.23 percent. All three indices were positive for the period until the sharp drop following the surprising Brexit vote in late June. A decline in expected corporate earnings also weighed on market performance. Per FactSet, the estimated earnings drop for the second quarter is 5.2 percent, down from a March 31 estimate for a 2.8-percent decline. Moreover, expectations for a further decline are widespread. Technical factors also weakened in June. All three indices dipped below their 200-day moving averages, though only the Nasdaq ended the quarter below this level. Developed international markets fared worse than U.S. markets for the month and quarter. The MSCI EAFE Index of developed markets around the world was down 3.36 percent in June and 1.46 percent for the quarter. Technical factors were also weak, as the index fell below its 200-day moving average at June’s end. The MSCI Emerging Markets Index performed significantly better than the EAFE, gaining 4.10 percent in June and a smaller 0.80 percent for the quarter. Technical factors remained positive. The broad fixed income markets had a strong month and quarter. The Barclays Capital Aggregate Bond Index rose 1.80 percent in June and 2.21 percent for the quarter. The Barclays Capital U.S. Corporate High Yield Index also performed well, up 0.92 percent and 5.52 percent for the month and quarter, respectively. Domestic economic news for the quarter was mostly positive, with strength in housing and consumer data offsetting a worrying drop in job creation. Also positive was the upward revision of first-quarter gross domestic product (GDP) growth to 1.1 percent. Despite a disappointing May jobs report, consumer confidence increased to the highest level since last October (see Figure 1) and personal spending continued to increase, up 0.2 percent in May with an upward revision for April to a gain of 0.5 percent. Housing also supported the economy during the quarter. Existing home sales increased from 5.33 million to 5.53 million in May, higher than initial estimates. Additionally, the 2.4-percent year-over-year increase in pending home sales in May indicates continued growth in the sector. Negative headlines around the world moved markets during the quarter, with the Brexit vote in particular roiling equity markets at the end of June. Although the referendum result increased uncertainty, its long-term impact on the U.S. economy will likely be minimal. Looking toward Asia, China’s growth has continued to disappoint. To counter the slowdown, China has been devaluing the yuan, leading to that currency’s lowest level against the U.S. dollar since December 2010. We end the quarter in a similar position to where we started. U.S. growth continues, with some concerns and risks. International political and economic risks still ebb and flow. At the same time, we have made progress. Consumer confidence and spending are on the upswing, we survived the Brexit vote without serious damage, and economic headwinds continue to abate. The U.S. economy leads the developed world, and U.S. markets are still attractive to global investors. Though international markets look risky, as we have just seen, even real risks won’t necessarily derail the recovery. As always, we continue to recommend a well-diversified portfolio; it is the best path for arriving at a long-term financial destination despite short-term uncertainty. Disclosure: Certain sections of this commentary contain forward-looking statements that are based on our reasonable expectations, estimates, projections, and assumptions. Forward-looking statements are not guarantees of future performance and involve certain risks and uncertainties, which are difficult to predict. Past performance is not indicative of future results. Diversification does not assure a profit or protect against loss in declining markets. All indices are unmanaged and investors cannot invest directly into an index. The S&P 500 Index is a broad-based measurement of changes in stock market conditions based on the average performance of 500 widely held common stocks. The Dow Jones Industrial Average is a price-weighted average of 30 actively traded blue-chip stocks. The Nasdaq Composite Index measures the performance of all issues listed in the Nasdaq Stock Market, except for rights, warrants, units, and convertible debentures. The MSCI EAFE Index is a float-adjusted market capitalization index designed to measure developed market equity performance, excluding the U.S. and Canada. The MSCI Emerging Markets Index is a market capitalization-weighted index composed of companies representative of the market structure of 26 emerging market countries in Europe, Latin America, and the Pacific Basin. It excludes closed markets and those shares in otherwise free markets that are not purchasable by foreigners. The Barclays Capital Aggregate Bond Index is an unmanaged market value-weighted index representing securities that are SEC-registered, taxable, and dollar-denominated. It covers the U.S. investment-grade fixed-rate bond market, with index components for a combination of the Barclays Capital government and corporate securities, mortgage-backed pass-through securities, and asset-backed securities. The Barclays Capital U.S. Corporate High Yield Index covers the USD-denominated, non-investment-grade, fixed-rate, taxable corporate bond market. Securities are classified as high-yield if the middle rating of Moody’s, Fitch, and S&P is Ba1/BB+/BB+ or below. Co-authored by Brad McMillan, senior vice president, chief investment officer, and Sam Millette, investment research associate, at Commonwealth Financial Network. 2016 Midyear Update: Second Half to Bring Repeat Performance? It has been an exciting year so far. With U.S. markets dropping 15 percent in the first quarter before rebounding, and many international markets having done worse, the red flag has been raised for market risks. With Europe continuing to wrestle with economic and political challenges, the prospect of a breakup of the union via a British exit (aka Brexit) has never been more real. And with Chinese growth continuing below expectations, we see risk everywhere we look. At the same time, there is lots of good news. U.S. hiring continues at a strong pace, despite recent weakness. European growth continues positive, and the European Central Bank is finally fully committed to helping that growth along. The Chinese government has always had the resources, but recently it has also found the will to support its own economy again. For the remainder of 2016, we may see neither boom nor collapse, just more of the same back-and-forth slow growth of the past two years. There could, however, be moments of exhilaration, moments of depression, and moments of sheer panic. Let’s take a look at where we are now and then look toward the future to see what some of those moments may look like. Growth in the first quarter was anemic. The slowdown from the last quarter of 2015 continued, driven by continued weakness in oil prices, which hurt business investment; slow wage growth, which affected consumer spending growth; and general uncertainty, driven by troubles in Europe and Asia. There are signs the slowdown is ending, however. The service sector remains in positive territory, after several months of weakness. The manufacturing sector has moved back into the positive zone after months in contraction. Europe and Asia have continued to grow, despite the uncertainties there. 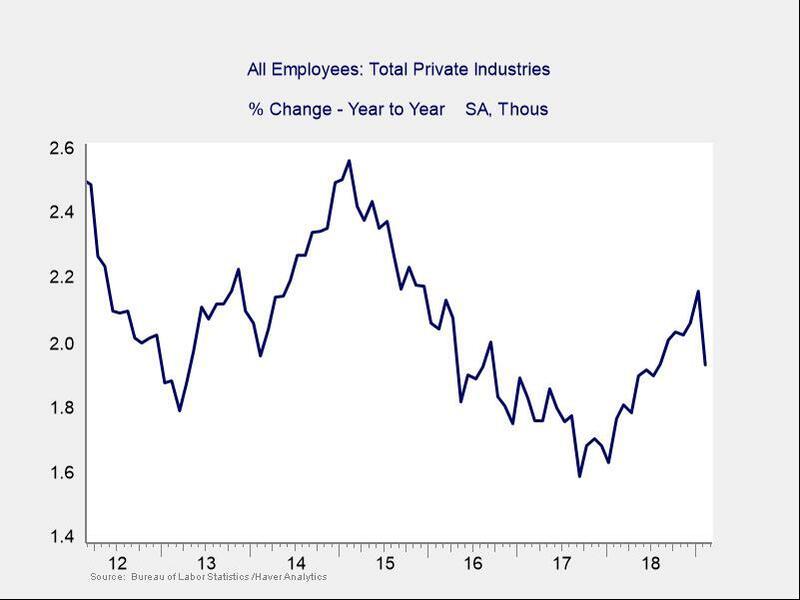 And even wage growth continues to trend up. Although it’s been a first half primarily characterized by slow growth, the second half is looking somewhat better. Corporate America is showing the same trends. After suffering from a meltdown in the energy sector and a collapse in export growth due to the strong dollar, company earnings expectations were cut by the greatest amount since the financial crisis. The fact is, though, that even as earnings estimates have been cut, both of the negative macro trends have reversed. In addition, many companies have been doing their best to cut costs and become more competitive. With improvements both in general conditions (as oil prices rise and the dollar sinks) and in company competitiveness, the chances of profits beating these depressed expectations are better than is generally expected. We might not actually return to growth in the second half of the year, but we can see it coming. Overall, the second half of 2016 has the potential to be one of economic growth here in the U.S. and around the world, based on a combination of organic growth in employment, demand, and global central bank stimulus. With that said, there are risks that could derail the recovery. The U.S. election is certainly one risk factor, as there is more uncertainty than we have ever seen from a policy perspective. But the biggest risks are international—with the potential for real shocks that could shake the U.S. The U.S. election. In this election season, most of the press attention has been on the candidates. But it’s the policies that really matter. With investors waiting for more certainty around policy outcomes, and businesses doing the same, the potential for the election to cause slower economic growth and market tremors is very real. Brexit. Just as in the U.S., the political uncertainty in Europe continues to rise. Although the U.K.’s June referendum on leaving the EU may rattle markets, significant disruption in 2016 is unlikely. Even if Britain were to vote to leave the EU, this would simply mark the start of a multiyear negotiation about exactly what this exit would mean. U.S. corporate earnings. With a likely fourth quarter in a row of declining earnings, declining margins, and market valuation levels still at exceedingly high levels, the risk imposed by continued weakness is very real and very likely. Increased consumer spending growth, as well as higher oil prices and a weaker dollar, could help offset these factors, which could help the top line and help preserve profits even as margins decrease. Chinese currency devaluation. This is the big one. Much of the global uncertainty in late 2015 came from China’s surprise currency devaluation, which threatened to create a vicious downward cycle of cuts to spending and investment. That risk has subsided for the moment, as the Chinese government has increased fiscal and monetary stimulus to kick-start growth again. Unfortunately, the stimulus is no longer as effective as it once was. If stimulus fails, further currency devaluation might be China’s only course. Such a devaluation would export deflation to the rest of the world, making an existing global problem worse. It would also hurt other trading nations by stealing their exports, and it would encourage other countries to do the same, potentially starting a worldwide currency war. China appears willing and able to continue its current stimulus policies for at least the rest of 2016. But the political winds could change at any time, with potentially serious consequences. Higher oil and commodity prices. For all the concern about the negative impact of low oil prices on the world economy, the effects have been quite positive overall. Benefits for American consumers have been offset by a decline in energy-sector employment and investment, but elsewhere in the world, the benefits have been more pronounced. Europe and China, for example, import two to three times more petroleum products as a percentage of gross domestic product (GDP) than the U.S. Economic growth in those regions likely would have been substantially worse with higher oil prices. Therein lies the risk. Much of the recovery we have seen can be attributed to the effects of low oil prices. As prices rise, that recovery may be in jeopardy. Again, we would be less exposed to such damage here in the U.S., but the damage of a price spike could be widespread and the benefits limited. Such a spike is unlikely to happen in 2016, due to very high levels of oil stocks in storage and ongoing overproduction. On the other hand, given wars in Syria and Yemen, unrest in Libya, and the potential for a difficult Iranian reentry into the market, a supply shock and subsequent price spike isn’t out of the question. What are the expectations going forward? Given all of the above risk factors, what are the expectations for the global recovery? The world economy is likely to continue to grow slowly. With signs of organic growth continuing in the U.S. and emerging in Europe, substantial stimulus continuing in the U.S. and on the rise in Europe and China, and energy and currency markets returning to normal, much of the damage has already happened. It would likely take a substantial external shock to derail the global recovery in 2016. The potential for such shocks, however, is very real, particularly in Europe. On balance, the bad possibilities substantially outweigh the good ones. It is hard to see what might generate an upside surprise and all too easy to see what might knock us down. With growth slow and downside risks high, don’t expect central banks around the globe to tighten substantially, or at all, during 2016. Even in the U.S., any tightening is likely to be limited. Moreover, at the long end of the market, rates in the U.S. will still be held down by low rates elsewhere. Interest rates are likely to increase only modestly, if at all, and may well decline. Stock markets are, in general, not cheap, but there is a wide range of valuations. With growth likely to stay low, market appreciation will probably come only from organic growth or multiple expansions. 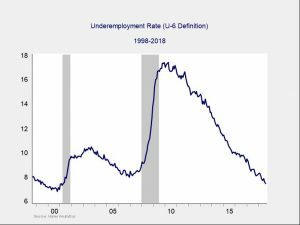 There is quite a bit of good in the global economy and particularly here in the U.S. Employment continues to grow, and although consumer spending is not growing as quickly as it could, there are signs that this trend may be changing. Although business has suffered from lower oil prices and a strong dollar, it has largely weathered the challenge and is now poised to potentially benefit as those headwinds abate. The foundations of the economy—total employment (growing), consumer spending (increasing), and the service sector (expanding)—remain reasonably stable, and the rest of 2016 may see faster growth than the first half. Financial markets may also benefit from this faster growth. Still, corporate earnings are not doing as well as the larger economy. Even the expected resumption of earnings growth will be hard pressed to match current valuation levels. As such, markets are likely to bounce around current levels and show limited, if any, appreciation through the end of the year. For both the economy and the markets, then, we expect the second half of 2016 to look somewhat better than the first—with continuing, and perhaps accelerating, growth but a volatile stock market. Over that period, the risks appear generally balanced, with the possibility of accelerating U.S. growth offsetting, at least for the U.S. itself, the systemic risks in the rest of the world. Moving into 2017, global risks could become more meaningful, but we are not there just yet. Disclosures: Certain sections of this commentary contain forward-looking statements that are based on our reasonable expectations, estimates, projections, and assumptions. Forward-looking statements are not guarantees of future performance and involve certain risks and uncertainties, which are difficult to predict. All indices are unmanaged and are not available for direct investment by the public. Past performance is not indicative of future results. Diversification and asset allocation programs do not assure a profit or protect against loss in declining markets. No program can guarantee that any objective or goal will be achieved. The S&P 500 is based on the average performance of the 500 industrial stocks monitored by Standard & Poor’s. Emerging market investments involve higher risks than investments from developed countries and also involve increased risks due to differences in accounting methods, foreign taxation, political instability, and currency fluctuation. Authored by Brad McMillan, CFA®, CAIA, MAI, senior vice president, chief investment officer, at Commonwealth Financial Network. 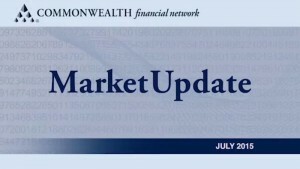 Click here to watch and listen to the Q2 Market update by Brad McMillan, Senior Vice President at Commonwealth Financial Network. 1) Check your credit report and score. Having a good credit rating can affect everything from gettinga home loan to the way applications for insurance and even employment are considered. Since you’re entitled to one free annual credit report from each of the three credit reporting agencies- Equifax, TransUnion and Experian– why not check to ensure your report is accurate. This is also a smart way to catch any signs of identity theft. See where you stand at www.annualcreditreport.com. 2) Revamp your emergency fund. 3 months of expenses is the recommended amount to set aside in your emergency stash. Factors you should consider in determining the size of the fund are family size, current debt and insurance coverage. If you already have an emergency fund, great job! Now consider boosting it to 6 months of reserves. Feeling prepared is a great stress reducer. 3) Revisit credit cards. Check out the terms and conditions of your credit cards to make sure they’re still in line with what you signed up for. Some good news about newer credit cards is that they can be equipped with computer chips that provide unique identifiers for each transaction, so hackers can’t reuse your information on another purchase. 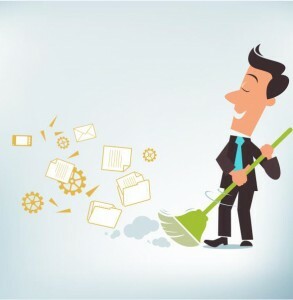 4) Go paperless. Online banking, electronic bill payment and E-delivery of investment statements are great for the environment and remove the clutter of paper statements. Automated electronic payment also makes it simple to effortlessly pay everything on time. 5) Do an overall financial review. Take the pulse of insurance policies, annuity contracts, retirement plans, and educational savings accounts. Are you reaching your goals? Are your beneficiary designations current? Do you have any questions and are we in the loop with any changes in your situation so we can update your plan accordingly? The sooner, the better. It’s a saying that applies to many facets of life, including educating children about money. By introducing sound financial habits early on, you’ll give your child a head start on the path to becoming an informed investor. Here are some creative ideas, as well as book and website suggestions, for raising a financially savvy kid. LeapFrog Learn & Groove Animal Sounds Guitar. Through rhythm, rhyme, and sing-along songs, children can rock out while sharpening their counting skills. Learning Resources Counting Cookies. This set of 10 numbered cookies (each with a corresponding number of chips) makes learning to count delicious. Chicco Teddy Count-With-Me. Children can learn their first numbers and words in English and Spanish with this bilingual talking bear. Infantino Development Toy, Counting Penguin. Your child inserts colored fish into a penguin’s mouth and learns to count from 1 to 10. ABC 123 Magnetic Poetry kit. For older toddlers, these magnets promote learning their letters and numbers. Ages 5 and over. Board games are an entertaining way to teach kids about managing finances. Monopoly covers all the bases—earning money, saving and spending, capital budgeting, risk and reward, and taxes. This classic game now comes in an electronic banking edition and even as a smartphone or tablet application. Other options for a fun-filled family game night include the Game of Life, Billionaire Tycoon, Moneywise Kids, and Payday. Ages 8 to preteen. At this stage, many children start to accumulate income from allowances, cash gifts from birthdays and special occasions, and even small businesses, like lemonade stands or shoveling driveways. As your child begins dealing with actual money—no matter how small the amount—talk to him or her about saving and spending. Because many kids in this age group are Internet experts, online games can be an effective teaching tool. Teenage years. As a teen, your child may take his or her first summer job or build income through part-time work like babysitting. Visit the local bank together and set up personal savings and checking accounts in his or her name. This will give your child a sense of responsibility and help familiarize him or her with different banking transactions. Plus, banks often offer useful resources geared toward young customers. Books on personal finance kill two birds with one stone: getting children to read while teaching them an important life skill. Full of illustrations on all aspects of money and finance, Neale S. Godfrey’s Ultimate Kids’ Money Book is a great resource for children ages 7–12. For young people ages 13 and up, Growing Money: A Complete (and Completely Updated!) Investing Guide for Kids by Gail Karlitz and Debbie Honig focuses solely on investing. Written especially for parents, Yes, You Can . . . Raise Financially Aware Kids by Jack Jonathan includes activities that you can do with your child to put financial concepts into practice. One of the best websites for teaching kids about money is www.monetta.com/game.htm, presented by the Monetta Young Investor Fund, a mutual fund that invests in companies familiar to children and teenagers. Although most of the games can be found elsewhere online, the site brings them all together and organizes them by age group. The games are free and range from basic quizzes to more advanced activities. Of course, there are plenty of other websit es that aim to help children build their financial literacy. But, remember, although the Internet can be a valuable tool, it’s no substitute for one-on-one conversations and your own good example. As with many financial matters, the best advice is to start early. 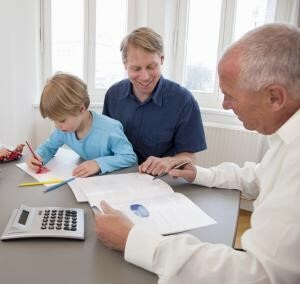 The sooner children learn financial fundamentals, the more likely they are to become informed investors later in life. You may even benefit from learning alongside your child! If there are areas where you could use a refresher, take the time to review those topics as you approach them with your son or daughter. For the second year in a row, U.S. markets were the place to be, closing 2014 with a very strong fourth quarter despite a weak December. The Dow Jones Industrial Average was up 0.12 percent in December but a much stronger 5.20 percent for the quarter. The S&P 500 Index was down 0.25 percent in December but posted a 4.93-percent gain for the quarter. The Nasdaq lost 1.16 percent for the month, though it gained 5.40 percent during the quarter. Gains for the year were widespread, with the Dow and Nasdaq up 10.04 percent and 13.40 percent, respectively. The S&P 500 did best, gaining 13.69 percent for the year. U.S. economic growth accelerated, with the most recent report on gross domestic product (GDP) growth announcing a 5-percent gain for the third quarter. Corporate revenues and earnings also increased. An increase in market valuation levels supported share price gains. At year-end, U.S. markets were at or close to all-time highs, and technical factors remained strong. International markets underperformed U.S. markets over the month, quarter, and year. The MSCI EAFE Index, representing developed international markets, was down 3.46 percent for December and 3.57 percent for the quarter. The MSCI Emerging Markets Index did worse, declining 4.82 percent in December and 4.88 percent for the fourth quarter. For the year, developed markets were down 4.90 percent, and emerging markets dropped 4.63 percent. Technical factors were soft, with both indices well below their 200-day moving averages. The Barclays Capital Aggregate Bond Index was up 0.10 percent for December and 1.79 percent for the fourth quarter, contributing to a 5.97-percent gain for the year. This strong performance was driven by a consistent, and unexpected, decline in interest rates throughout 2014. Rates on the benchmark 10-year U.S. Treasury bond declined from 3 percent to 2.17 percent during the year, largely driven by uncertainty elsewhere in the world. The major economic story for the fourth quarter was the Fed’s decision, driven by ongoing economic improvement, to stop buying bonds, signaling that, in its judgment, the economy didn’t need the support. In fact, by year-end, the U.S. recovery was moving from strength to strength. The 5-percent third-quarter GDP number was the strongest since 2003. Moreover, as our chart shows, there has been a consistent increase in GDP in recent years.